Ever since the Houston Oilers owner Bud Adams, in a snit after being refused a new stadium, took his football team to Nashville in 1997 and renamed it the Tennessee Titans, the fate of the Astrodome has been up in the air. Matters were made worse when, instead of rehabilitating the Astrodome a new, neo-traditionalist baseball stadium, Minute Maid Park, was built down-town for the Astros in 1999, and then in 2002, a hulking new football stadium, Reliant Center, was built uncomfortably close to its predecessor to house the replacement team, the Houston Texans, and the Houston Rodeo. The Astrodome, designed by local architects Lloyd, Morgan & Jones and Wilson, Morris, Crain & Anderson, opened in 1965 to national acclaim as the nation’s first covered and completely air-conditioned baseball and football stadium. It was inspired by Harris County Judge Roy Hofheinz’s visit to the ancient Roman Colosseum, where he learned that a retractable canvas cover, the velarium, was once extended to shade most of the seats from the hot Italian sun. The novelty of the covered Texas sports stadium and its one-of-a-kind AstroTurf were pivotal points in the history of sports facilities. However, the decades have taken their toll. And in comparison to the recent crop of flashy new stadiums, the Astrodome looks downright dumpy. In a city that generally equates old with bad, these kinds of situations are usually resolved by demolition. Think Shamrock Hotel (largest hotel in America when it was opened in 1949); River Oaks Shopping Center (the New Deal-era prototype for an uncountable number of strip centers in the country); the Prudential Building (Houston’s first “suburban” skyscraper); and—being demolished as I write this—the former Foley Brothers department store (the grandest and last major downtown department store to be built in any American city). Given this trend, one cannot help but be surprised by what seems to be a miraculous turn of events. Almost as soon as the Astrodome was mothballed, eager would-be developers began pushing proposals for its redevelopment. The pressure increased notably when it became clear that Harris County is using some $3 million to $4 million of public money to maintain the stadium in its unused state each year. Suggestions included hotels, casinos, movie studios, amusement parks, museums, and, my personal favorite, a scheme by recent University of Houston architectural graduate student Ryan Slattery to strip the dome to its steel skeleton and repurpose it as a gigantic, 9-acre gazebo to shade a variety of outdoor activities. Reject, reject, reject. But with the news that Houston will be the location of the 2017 Super Bowl, speculation has intensified that current Harris County Judge Ed Emmett must decide if the Astrodome is to be demolished, as seems to be the desire of the Houston Rodeo in particular, or to be rehabilitated, as seems to be the desire of most Houstonians, who increasingly see it as the city’s signature architectural landmark. Rehabilitation of the iconic building would clearly avoid national embarrassment when the anticipated hordes of visiting sports commentators and football fans descend upon Reliant Stadium. 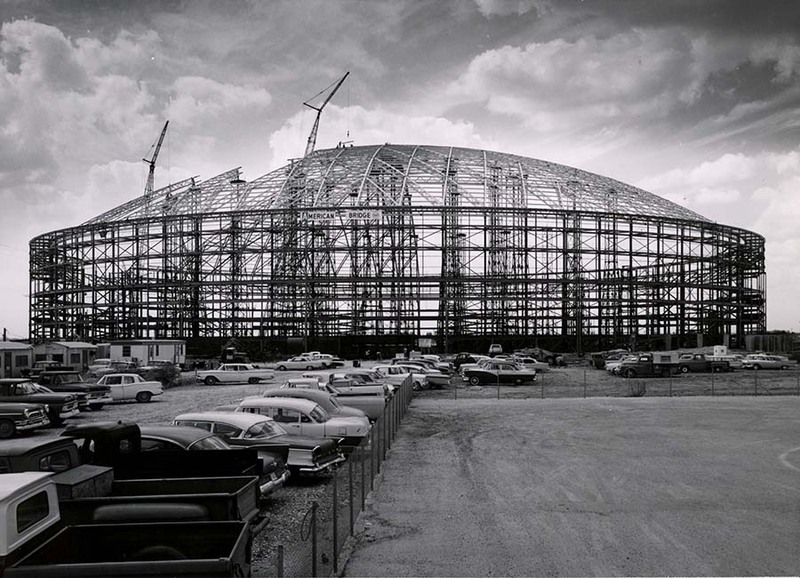 National attention to Houston’s conundrum included articles in the New York Times and the National Trust for Historic Preservation’s decision to include the Astrodome on its 2013 list of America’s 11 Most Endangered Historic Places. This summer, Judge Emmett issued an ultimatum that redevelopment proposals would have to be submitted by June 10. The Harris County Sports and Convention Corporation (HCSCC) selected one of the proposals and will put it forward for a public vote in November for bond approvals. If the proposal is rejected, the Astrodome will be demolished. In late June, the HCSCC reviewed the 19 official submissions and duly approved what appears to be a somewhat banal scheme. “The New Dome Experience,” presented by HCSCC Executive Director Willie Loston, seeks to repurpose the Astrodome as a 350,000-sf column-free exhibition space, with an estimated price tag of $194 million. Why such a large convention center? For one thing, participants of the Offshore Technology Conference, which has annual trade shows at the Reliant Center, have been pushing to exhibit ever-larger oil and gas production devices—imagine entire offshore drilling rigs. Other sug­gested uses include moving the Rodeo’s carnival under cover, housing high school football games, and providing the ever-popular emergency hous­ing in times of disaster. Emmett was recently quoted by writer Whitney Radley as saying, “I think the concept is outstanding, and at the end of it, I really believe that Houston and Harris County would become the event capital of the world.” It’s not all just boosterism, however. This scheme also proposes to include some 400,000 sf of programmed, semi-public outdoor space. So here’s to its success at the ballot boxes in November and to the hope that Houston might someday realize that its architectural patrimony is indeed worth maintaining rather than destroying. Ben Koush is a Houston-based architect and writer.